This plugin was created as I found need to have the ability to extract separate displacement maps per sculpted layer in Zbrush, which I wasn't able to do with the tools available at the time (this may have changed). 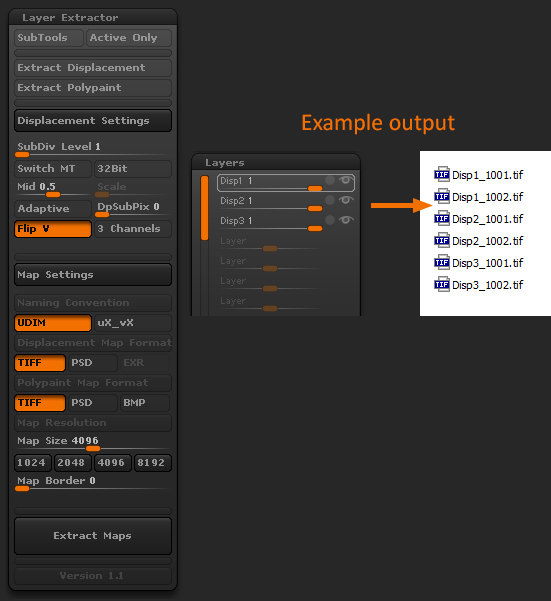 So all in all, this plugin will allow you to extract a separate displacement map per layer, per subtool, per uv tile. However, please bear in mind that there is currently no option to merge maps that are extract from different subtools that sit on the same UDim. Usage: This tool is free to use by anyone for anything! Info: Any issues, bugs, requests, questions about this plugin.. please feel free to email me!